We have been tracking an issue that prevented some users of OSX Snow Leopard 10.6 (and some OSX Lion 10.7 that upgraded from 10.6) from printing when using iOS6. It was not easy to reproduce but we manage to pull it off. 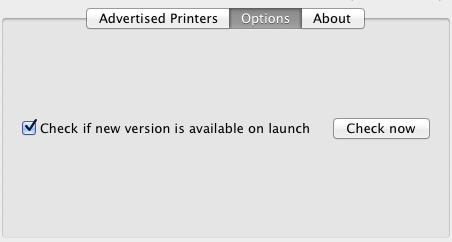 As usual you can grab a copy of the latest version on the main page of AirPrint Activator. Using IOS6 on iPad3 & iPhone. Prior to installing IOS6 the wireless printer was picked up by both. Now both fail to see the printer(s). I can’t find my printer… Mountain Lion 10.8.2 and iOS6 on iPhone 4S. Apple I Hate you!!!! I just think to get Windows again!! Turned off the firewall (Mac OS 10.6.8) and it worked perfectly! Grabbed 3.1.0 to test drive it – although it says it supports 10.6, I’m getting the circle-slash on the app & “You can’t open the application because it is not supported on this type of mac..” that would be an Intel Core Duo, running 10.6.8.. so.. what am I missing? Sorry Roy, We no longer support non 64bit platform. We had to sacrifice it when we moved to ARC based project in XCode. I’m running OS X 10.5.8 on a Mac Mini. Is there a compatible Handyprint version for this OS? I downloaded Airprint Activator yesterday. It works great unless my Mac is asleep. Is there a way that Activator can wake it up so that I don’t have to run downstairs to wake it up before I can print? I downloaded the version 3.1.1, but with ios 6 i didn’see my printer on my phone. In handyprinter i see my shared printer normaly as in the past. The printer is an Officejet 6500 E709n. Before i updated to ios6 the printer worked as well. My mac has an OSX 10.8.2. This is odd. What version of iOS? My printer shows on the software, not on the hardware and therefore unusable. I’m running 10.6.8 on my Macbook Pro so it should work with your new software but when I download the app it comes up saying this app is not supported on my mac. My firewall is not on, why won’t this work? I have the same problem that sophiep has. My mac runs 10.6.8 (it is an old Macmini with Intel 1,66 Ghz Core Duo) and i have got the same icon (printer with forbidden signal) and an advise later. What can i do? (I used airprint since first version). another frustrated 32bit snow leopard user…apple can’t even include a 32bit compile switch? sounds like an underhanded way of forcing hardware upgrades….I don’t recall Microsoft doing anything quite this obvious (maybe its time to switch back – I hear windows is actually now a competitive product)… just had to chirp in my 2c….not a gripe against you guys at all….air print activator rocks and works nicely around yet another hp/apple “buy new stuff” scam. thanks guys. Not supporting 32 bit 10.6.8 is disappointing. Now, instead of giving you my money, I get to give it to someone else who supports my OS and CPU. Good business move. Using Lion version 10.7.5 and ipad 4 it took 10mins to load and activate can now print on all apple units. II am a newbie to Apple this year so still on the curve but so far great. I have a 32-bit MacBook Pro running Snow Leopard and can’t use the new version because it’s 64-bit. I was wondering if you have a 32-bit version available? ” The OS X Firewall appear to be turned ON on your Mac.